White Dwarf #37 opens up 1983 with what will be the first full year of monthly issues for WD. At this point in time I was DEEP into D&D and AD&D, often mixing the games as was our wont. The cover art is a small faerie, perfect for the article coming up. We start off the issue with a large number of ads (more Judge Dredd) and then the editorial. Ian Livingstone laments the lack of British RPGs, complaining that the recent downturn of the Pound vs the Dollar have made American RPGs kind of expensive. o for myself I would have sworn there were British RPGs out at this point, but I guess I was wrong. 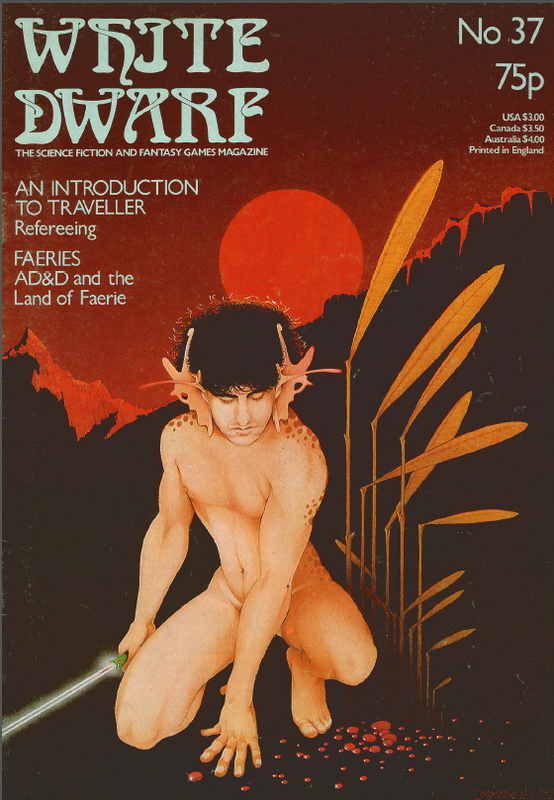 First up we have the aforementioned article on Faeries. This is an attempt by the author, Alan E. Paull to bring AD&D in line with the land of Fae; or at least close to it. This first entry is short (2 pages) but a great start really. Faerie should be so much more than what it typically is in *D&D. Next issue will have stats. Andy Slack is back with An Introduction to Traveller. This issue is Part 2: Refereeing. He covers a lot of the published material out there and how to use it to help your game. Open Box is next with reviews of Soloquest from from Chaosium. This little gem helps you run a solo RuneQuest game. It has some interesting ideas (DreamQuest, Maguffin Hunt) that I think might be interesting to try in D&D or even CoC. Clive Bailey gave it a 9/10 all by himself. Star Frontiers is next. I had just gotten this one for Chistmas so I was quite excited to build my own adventures from Star Wars, Star Trek and Hitchhikers Guide to the Galaxy. Yes my very first character was a Vrusk named Zaphod. Andy Slack likes the rules and what you get in the box, but does not like the lack of space travel rules, (Night Hawks was still a bit away) and gives it a 7/10. Eventually my issue with Star Frontiers was the same as one of my issues with Traveller; it degraded into D&D in Space. Er, wait, sorry. D&D in SPPAAAAAACE! Lastly we have a Play By Mail game, Crasimoff's world "The International game for the modern thinking mind". Trevor Graver likes the detail and gives it 8/10 but dislikes the poor English and slow turnaround time (2 weeks). Marcus Rowland, of future Forgotten Futures fame, http://www.forgottenfutures.co.uk/ has a GREAT article on Vampires. This article is a great companion piece to the old Dragon article Varieties of Vampires. This article was fodder for me and my games. I don't think I had a single vampire that was 100% like another in my games. Great things about this article, vampires getting more powerful with age, variations on powers and weaknesses. Great, great stuff really. City in the Swamp was another one of those articles that made their way into my world myths. My Necromancer from a few issues back had his base of operations in a swamp. Actually a lot of things went into making that character, but this was one of those pieces. Graeme Davis gives us this adventure for 5th to 7th level characters. Letters are up next. A reader LOVES the Necromancer, calling it the best class White Dwarf has done yet. Not so says Don Turnbull, putting on his official TSR cap, he calls the Necromancer "most distasteful". Which gets a note from the editor reminding him (and us) that the class is an NPC class. Another reader dislikes Infravision based on what he knows about infra-red cameras. Another dislikes the constant D&D focus of everything and one more asking for better Traveller material. Lewis Pulsipher is back with D&D Scenarios, or what we would call adventure seeds today. Fiend Factory has some odd monsters that cross species. Some land dwelling reptilian cephalopods that seem to worship the god Pyaray from the Elric books. We also have chameleon cats, bird men and ant men. None are bad, I like I the cats, the Crestcats, but also none of them fill me with any desire to use them. This has been the case for Fiend Factory for a while now. RuneRites has two new Battle Magic spells from Richard Case and edited by Oliver Dickson. Starbase has more new vehicles for Traveller. Treasure Chest deals with AD&D encumbrance. I wonder if he ever got a response? I found someone the same age and grew up in the same area. I can report he seems successful and happily married. No I am not posting his name here. We end with a few more pages of ads. White Dwarf of 1983 is certainly taking a page or two from Dragon. The layout is cleaned up more and and there seems to be a great deal of professionalism as well. 83 was a big year for RPGs for me. Interesting to see this all again in the pages of WD. In January 1983, when WD #37 came out, there were no British RPGs at all - at least, not that I knew of. The first one was "Victorian Adventure" by Stephen Smith, whose first edition came out that year. It was self-published, and didn't set the world on fire. The first British RPG that made any kind of impact was WFRP in 1986. After I typed this up I went back and dug through more copies of WD, Imagine and Dragon from the time. I remembered WFRP and it's great ads back then. 30 years does a lot to degrade the old memory!